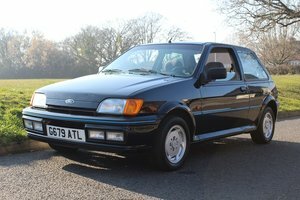 We of course appreciate that this may not be as sought after as a Mk1 XR2 even if it is rarer, however a Mk1 XR2 in similar condition, with similar mileage/owners would demand near double the asking price. First registered on the 1st of August 1981, and ordered in the somewhat rare colour ‘Dove Grey’ by Mr J Woods. 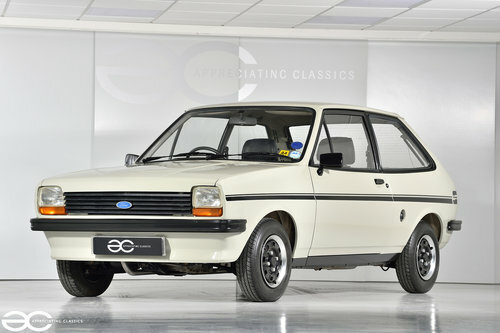 Original Ford supplier dealership Pre Delivery Inspection sheet present, and signed on the 2nd and 3rd of July 1981, along with a receipt and stamp for the 1st service carried out at 721 miles in September 1981. Original service book is present, with the owners certificate fully stamped, and first service stamped by supplying main dealer, Godfrey Davis. A MOT certificate is present, showing 15,537miles in 1986. Shortly after this time, Mr John Woods sadly passed away, and the car stayed in his garage until 2013. We purchased the car at this time, and fully recommissioned the vehicle before a good customer of ours purchased the car, and it has lived in heated storage for the last 4 years. All original handbooks are present, along with original Godfrey Davis sales literature. Receipts for the recommissioning works of course are present, including details of the full repaint. MOT certificates are present since being with the second owner – 2015,2016 and 2017. 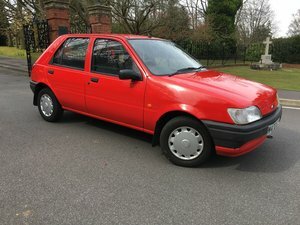 The car will have 12 months MOT in place once sold. When the vehicle arrived with us in 2013, the bodywork was in very good condition, however it did have some small imperfections. We decided to take the car to ‘The Bodycentre Limited’, Norfolks premier bodywork specialists. 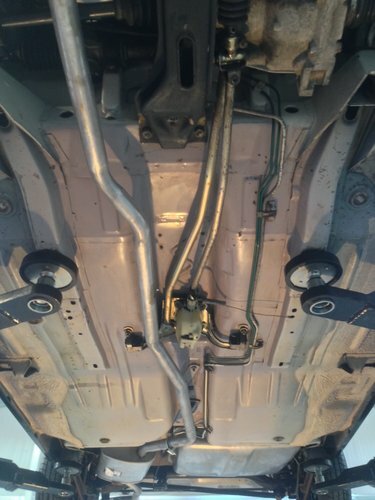 They stripped the car completely, all windows were removed, all external trims, the engine and gearbox were removed, and the preparation began. We have a large picture file of the works being carried out, from start to finish…It is obvious that this was a very thorough job, and the finish is second to none. The bill also substantiates the quality of workmanship, and time spent ensuring the bodywork is perfect, with the bill totaling around £4500.00. The car did not require any welding, as the car had no corrosion, and all panels are original panels. The underside, inner arches, exposed interior areas and inner boot floor are all in original finish. 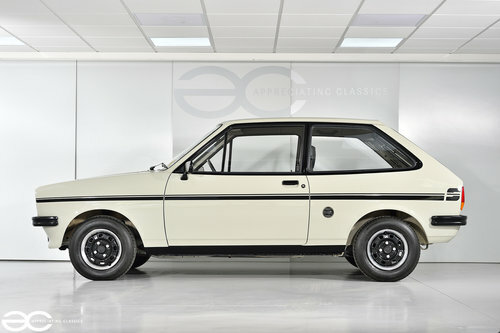 As seen in the pictures, the car presents extremely well and is quite likely the best remaining Mk1 Fiesta Sport. 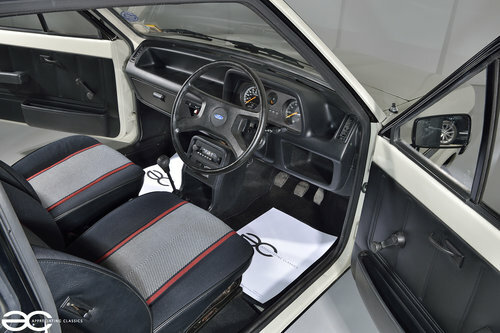 The interior is literally as new! Having been stored in the dark for so many years, the interior has not been subject to any UV exposure and has also never been damp. 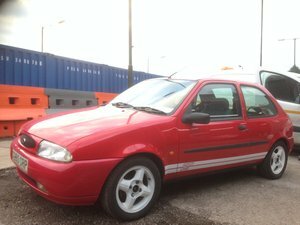 The red stripes are still a vibrant red, the seats are perfect, with zero damage or wear. Dashboard, centre console and door cards are again, without fault, without damage and without any markings. 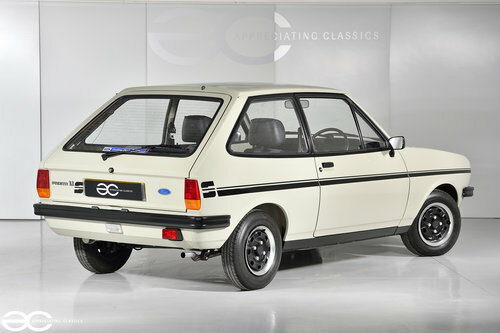 The headlining is perfect, as is the original parcel shelf. All switches work just as they should do, still feeling ‘tight’ and unused. Even the ignition barrel still feels new when putting the key into the ignition. 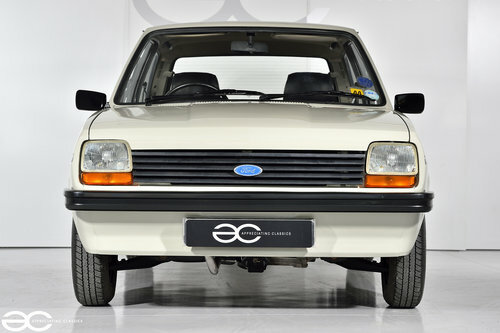 The term ‘Timewarp’ is often over used, but it is hard to describe this Fiesta in any other way…. a genuine Timewarp car indeed. Whilst the car was with the Bodycentre, we decided to have the engine and gearbox removed for two reasons. 1. The engine bay could be fully prepped and repainted correctly. 2. The engine and gearbox could be cleaned down, and brought up to the standard of the rest of the car. The engine runs fantastically, and is very quiet, unlike most of these engines now which have high mileage. 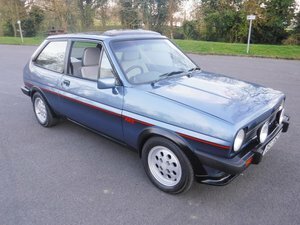 A perfect ‘tight’ gear change is still present, it is without doubt the best gear change we have felt in a Mk1 Fiesta..
We also had a full recommission service carried out, so all fluids, filters, belts, and some gaskets were replaced. 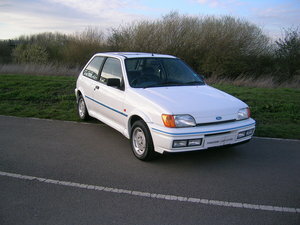 As you would expect, from a car with such low mileage, it drives superbly. The gearbox is precise, and still feels new when changing gear, the suspension and brakes are without any fault. 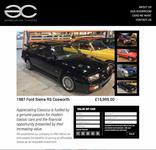 The car was fully checked over as part of our recommissioning, and has had works carried out. Some of the works are detailed below.